A nicely voiced boost for a lot more than increased volume. Good halfway house between overdrive and boost. Price. Connection options. 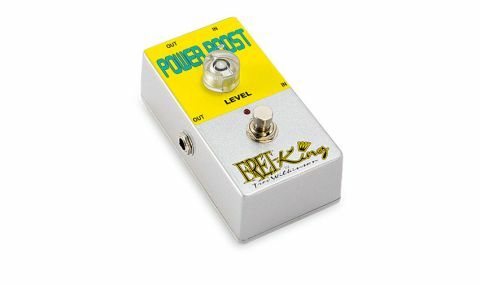 The Power Boost is the first of two boosts pedals in the new Fret-King pedal range. It offers 20dB of boost on tap, but while its sibling the Clean Boost is crystal clear, this has a certain edginess and dirt to the sound that will excite a valve amp into overdrive. "At full boost, the pedal made our cleanish valve amp sound superbly raunchy"
At full boost, the pedal made our cleanish valve amp sound superbly raunchy, and while the jump in level with the knob maxed out may be too much to make onstage switching practical, you could use this at the front end as a permanently-on component of your core sound. In some ways the Power Boost could be seen as a halfway house between a clean boost and an overdrive. If you have an amp sound that's just right but needs a touch more grit, as well as a volume boost for solos, it's a very practical alternative to using an overdrive pedal. It's also a contender for giving an overdrive or distortion pedal that extra push when needed.